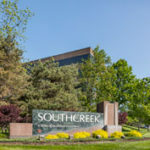 Southcreek Office Park Available Space from 3,082 – 3,482 sq. ft.
3,082 sq. ft. located in Building V. This first floor suite has easy highway access and on-site property management. It is divided into a waiting room, a conference room, a break area, a reception area, open office space, a work room, an office equipment room, and four individual offices. 3,440 sq. ft. located in Building I. This corner suite has an attractive lease rate! The space includes a break area, two work rooms, a conference room, a reception area, four individual offices, and open office space that we can help you design. 3,482 sq. ft. located in Building IX. This plug and play suite is already furnished with the communication and office infrastructure that your business needs. The price is negotiable, so come take a tour and see if this ready-to-go rental space is what you are looking for. If you want to learn more about how we can set you up in your ideal office space, give one of our commercial real estate brokers in Kansas City a call at 913-658-4100.